With its spectacular position on the Grand Canal and its lavish yet classic Venetian decor, Hotel Westin Europa Regina is the perfect place for a romantic break. This 5-star hotel is made up of five 17th century palaces, spread across several piazzis and adorned with marbled halls, glistening Murano chandeliers and the finest fabrics and furnishings. The hotel is just minutes away from the oldest church in Venice, Basilica della Salute, and a minute’s walk from St. Mark’s Square, the city’s most famous landmark. After exploring the treasures of Venice, retreat back to this charming haven and enjoy a Venetian dinner on a floating table surrounded by flowers at the hotel’s InAcqua restaurant. Try Italian classics and signature cocktails at Bar Tiepolo, or simply watch the world float by from the hotel’s stunning waterfront terrace. The hotel has 163 rooms and 17 suites. With panoramic views over Venice’s historic architecture, the aptly named InAcqua serves authentic Venetian cuisine along the Grand Canal. Home to Venice’s most romantic table and offering seasonally inspired dishes including seafood and pasta on the outdoor terraces, InAcqua is unparalleled in its stunning views. Open: 07:00 - 11:00, 12:00 - 14:30 and 19:00 - 22:30. Soak up the surroundings on the terrace at Bar Tiepolo, which serves signature cocktails and a delicious lunch and dinner menu. For an Italian classic, try a Peach Bellini, perfect for unwinding after a day of exploring. 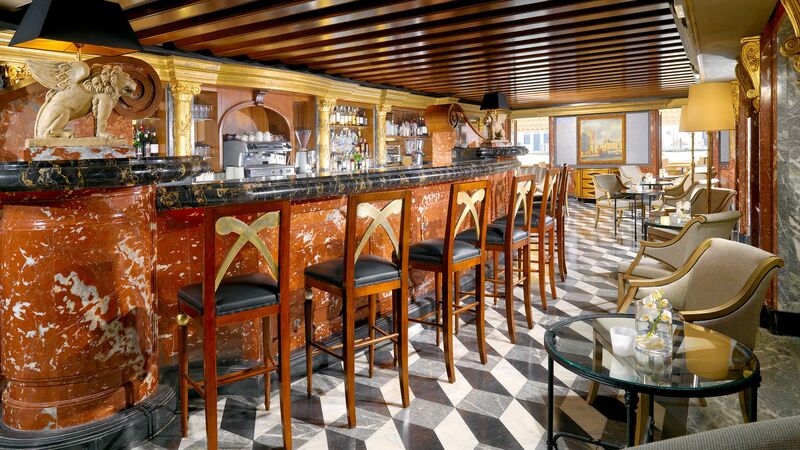 Bar Tiepolo is best enjoyed at dusk, when you can watch the sun setting over Venice and admire the dazzling reflections of the city lights on the Grand Canal waters. Located on the ground floor, the fitness centre has world-class branded equipment for all levels of levels of performance. 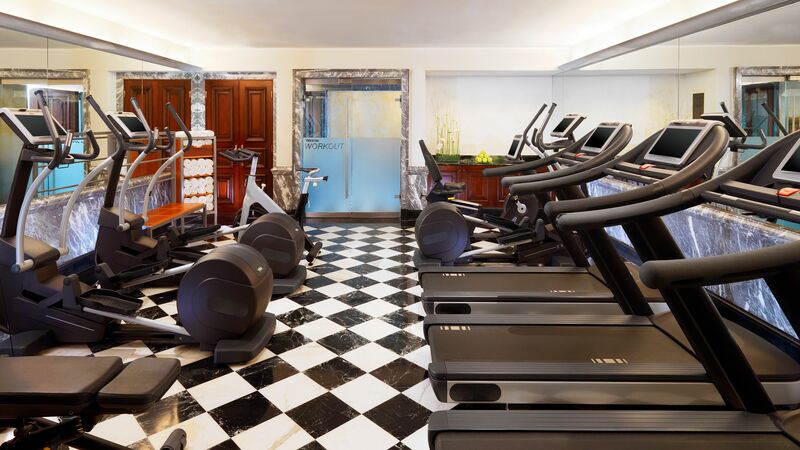 For a small fee, the hotel can provide workout wear for hire, including sports shoes and brand new socks. Indulge with the hotel’s in-room spa service, which offers custom designed treatments in the privacy and comfort of your room. You’ll be provided with a signature spa basket, containing aromatherapy oils, flowers, music and a nutritious snack. Needing little introduction, Venice is a picturesque haven. Its ornate bridges, waterside palazzi, gleaming canals and stunning views have featured in hundreds of brochures and travel magazines, often famed as the most romantic city on Earth. Each of the island’s six districts boast their own character - the famous piazza and basilica can be found in St. Mark’s Square, the Rialto Market and Bridge can be seen in the vibrant district of San Polo and Dorsoduro is home to the wonderful Accademia art gallery. For something more authentic, visit Cannaregio, a district unchanged by tourism and home to the most ancient Osteria in Venice, Osteria Al Bacco. Westin Europa Hotel Regina is 50 minutes from Marco Polo Airport. Grand Deluxe Rooms are located in the Regina, Barozzi and Ca Nova palaces of The Westin Europa & Regina overlooking neighbouring palaces, city rooftops, or stone paved alleys. One Bedroom Deluxe Suites are newly refurbished and individually designed. They have a Venetian atmosphere with details such as striped drapes, which recreate the gondola poles. Luxurious décor includes damask-lined walls and satin and velvet covered furnishings by historical Venetian weaving house, Lorenzo Rubelli. The suites are located in the Barozzi Palace and provide a view overlooking the tranquil courtyard with its antique well. Premium Venetian rooms are located within the hotel’s five palazzi, characteristic views of the city, terracotta rooftops or glimpses of the majestic canal. Some rooms have balconies which are strictly on a request basis. Stunning Grand Canal View Double Rooms are located in the Tiepolo, Palazzina and Regina Palaces. They are decorated with ivory coloured velvets and silks inspired by the mosaics and marbles of St. Mark's Basilica and have panoramic water views of Venice from San Giorgio island, across to Punta della Dogana, the beautiful Santa Maria della Salute Church, and beyond. Some rooms have balconies which are strictly on a request basis. “ Fabulous location and beautiful hotel! This review is long overdue but we had such a wonderful time here that I wanted to be sure to write about our stay. We loved Venice and much of that is due to staying at the Westin Europa & Regina. It is absolutely the best location right on the Grand Canal overlooking the beautiful church. We are Platinum level with Marriott and got free breakfast each morning which was delicious and allowed us to start our day with such a gorgeous view and relaxing setting. Lovely food and yummy Mimosas! Loved watching all the boats up & down the Canal. Just a great way to start our days! Our room was very traditionally styled which we like and wanted. We had a small Juliette balcony, not really usable, but could open to see the Canal. Our room was clean and the toiletries were my favorite of any hotel I've stayed at. 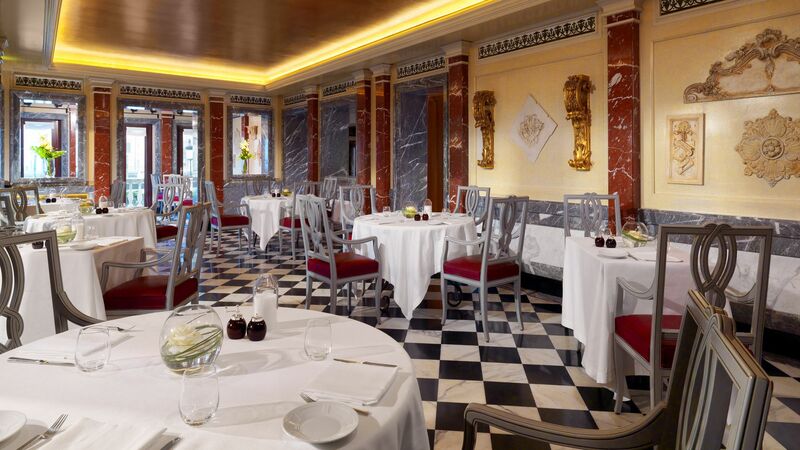 I should add, since we used points for our stay, I also considered the Hotel Danieli and the Gritti Palace. I am so glad we chose the Westin E/R. Our's was a better, quieter location than Danieli, though still very convenient to all the sights. We did go over to the Gritti for lunch one day, very pretty but crazy expensive! Same awesome view of the Grand Canal that we had and, I would say, one level up in the interiors though I didn't see a room. Both hotels are beautiful but I felt the Westin was a better value and a magnificent property. I appreciated the great service. Both concierges were so friendly and knowledgeable, went out of their way to help me with plans. I had written a couple of postcards and took to them to be mailed but didn't have change (couldn't be put on room charge). They held them for me until I did but we checked out the next day and I forgot about it. Well, I thought my family wouldn't receive the cards but, sure enough, the concierge took care of it and sent them on. I don't think we were even billed for it. Phenomenal service and kindness! I would absolutely stay here again and have recommended it to several friends. It was one of our favorite experiences in Venice. Others were riding the (shared) water taxi down the Grand Canal from our airport to hotel, and spending an evening in St. Mark's listening to the music and having wine that costs a small fortune (but worth it!). Oh, also wandering around the streets of Venice. Stay here! It will be a precious memory of your time in Venice. The rooms were very old, not very clean, dusty, house-keeping is poor. The location is good the lobby is fine but the rooms atmosphere is very bad. I would prefer to try other hotels than visiting this hotel again. It is said most of the hotels are old, but I would like to risk it. I was upgraded to the super deluxe room. The room is huge and very comfortable. This is not a very modern hotel but the antique decoration works for Venice. You can view the grand canal just behind the restaurant of the hotel. It's really a grand view. If you are not coming by the private motorboat then it's quite tricky to find the place especially in a rainy day. GPS and smartphone navigator don't work too well in Venice city because the area is too small to pinpoint your location accurately. Location wise is great, most of the hot spots are easily accessible. We loved the location of this hotel. It was only a few minutes from St. Mark?? ?s Square and right on the Grand Canal. There is only one small complaint we had. The weather was hot for the time of year, which is not the complaint :), but because the air conditioning system of the hotel was not fired-up, our room was excessively hot. We ended up sticking around the hotel more than we normally would. As it was the off-season, the outdoor restaurant was not open. This is why we stuck around - we got to use the outdoor patio at our leisure. We weren?? ?t allowed to bring the bar drinks out, so we just brought our own champagne, meats, cheeses, olives, etc., and enjoyed an afternoon watching all the traffic on the Grand Canal go by. It was an amazing day. This was a great hotel.